The 24 star's former ride, a 2005 Aston Martin DB9 luxury coupe, is currently for sale on eBay. Although Aston Martin is synonymous with Agent 007 of the British Secret Service, the brand is also a favorite amongst U.S. Federal Agents. 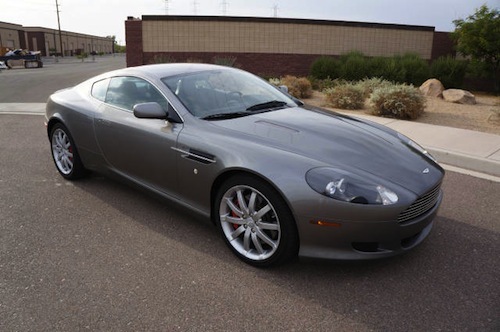 A 2005 Aston Martin DB9 once owned by Kiefer Sutherland — who played Special Agent Jack Bauer on 24 — is currently up for grabs on eBay Motors thanks to the Arizona-based DDW Partners Auto Sales. So what is the winning bidder in store for? Let’s start with what’s under the hood. This 2-door coupe features a 5.9L DOHC MPI 48-valve V12 engine and a 6-speed Touchtronic 2 automatic transmission w/electronic shift-by-wire control system, mode select, and manual mode. The DB9 can accelerate from 0 60 mph in 4.7 seconds and has a top speed of 186 mph. The 24 star's former ride has just 23,750 miles. Interior wise, Sutherland’s DB9 contains a whole hose of goodies including aluminum-faced instrumentation, climate control system, walnut wood and leather trim on doors and dashboard, and front reading lights. As for the vehicle’s exterior, it has swan-wing doors, rear LED fog lights, projector beam Xenon headlights, and power heated mirrors, and aluminum wheels. The celebrity-owned sports car touts a Buy It Now price of $65,950, and there are nine days left to purchase the vehicle. The listing also includes an option to make an offer less than the Buy It Now price. Full payment is required within 7 days of auction close. The listing claims that this 2005 Aston Martin DB9 is one of the cheapest in the country considering its low mileage. The ad also mentions that the vehicle was never smoked in and has no accident history. Introduced in 2004 as a replacement for the DB7, the Aston Martin DB9 was designed by Ian Callum and Henrik Fisker. It was the first model built at Aston Martin’s Gaydon facility in Warwickshire, England. Despite Sutherland’s affinity for British cars (he also owns a Range Rover), the actor has done voice over ads for Ford Motor Company in Canada since 2007. Ford’s hiring of Sutherland was not without controversy. In 2007, Mothers Against Drunk Driving (MADD) Canada demanded that Ford pull ads in which Sutherland did the voice-over following the actor's second drunk driving conviction. Prior to joining the Ford team in 2007, Sutherland’s recognizable voice was featured in a 2005 ad for the Citroen C4 sedan in Brazil. Interestingly, Kiefer is not the only member of the Sutherland clan to be featured in a car commercial. In fact, Donald Sutherland has been the voice of Volvo since 1994. What Happens When Aston Martin and Red Bull Racing Collaborate?